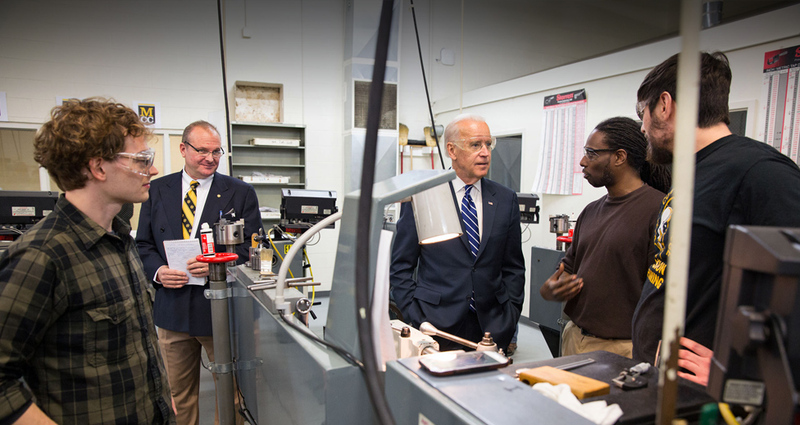 Let's equip our workers with the skills to compete in a 21st-century economy. "To make sure folks keep earning higher wages down the road, we have to do more to help Americans upgrade their skills. America thrived in the 20th century because we made high school free, sent a generation of GIs to college, trained the best workforce in the world. We were ahead of the curve. But other countries caught on. And in a 21st century economy that rewards knowledge like never before, we need to up our game. We need to do more." The premise is simple: If you're ready to work, you should be able to find a job that fits your skills. And if you want to move up within your field into a better job, you should have access to training to get the skills you need. In his 2014 State of the Union address, the President tasked Vice President Biden with leading a review of federal employment and training programs, with the aim of making them more job-driven. That review was completed, and the White House released a report identifying what is working across the country, detailing executive actions we're taking, and announcing new commitments by employers, non-profits, unions, and innovators to do what they can to make these training programs a priority. Now, it's time to build on that progress. Scroll down to learn more about why these training programs matter, which programs around the country are working best, and what you can do to contribute to that progress. Hear these people describe, in their own words, why these training programs are so important to American workers and our economy. There are programs at work right now to make sure Americans entering the workforce have the skills they need to fill the in-demand jobs currently available in their communities — and they're making a difference. 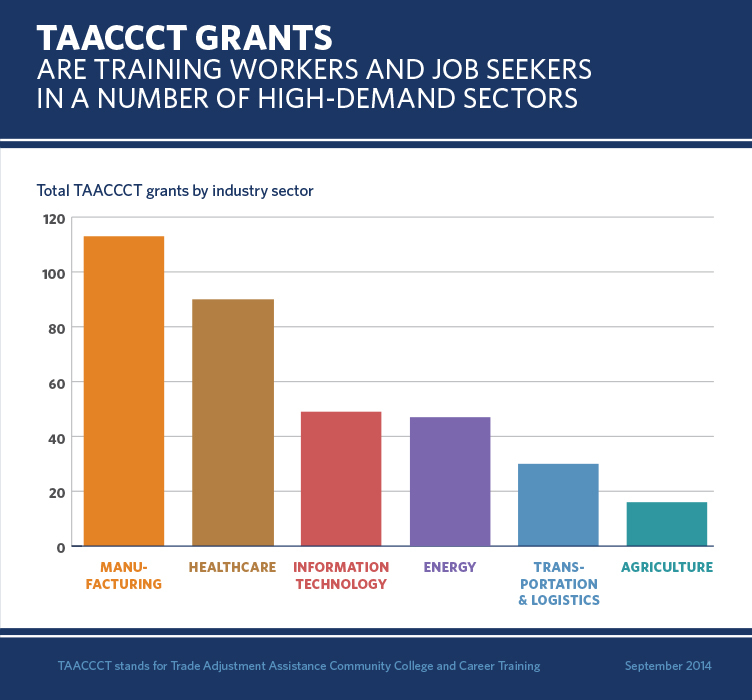 The Obama Administration has granted $450 million in TAACCCT (Trade Adjustment Assistance Community College and Career Training) grants to nearly 270 community colleges across the country. Watch Vice President Biden deliver remarks at an event announcing winners of those job-driven training grants. The Upskill Initiative is a public-private effort meant to create clear pathways for the more than 20 million workers in front-line jobs that too often lack opportunities to progress into higher-paying jobs. Developing the skills and abilities of these workers, and empowering them to contribute more at work, presents a significant opportunity to improve their wages and to increase the productivity and competitiveness of employers. American businesses are creating these jobs of the future at a breakneck pace, and we need to ensure that American employees have the right skills to fill them. Check out the stories of everyday Americans who “upskilled” their way to a higher-paying jobs and a brighter future thanks to a flexible learning opportunities in their companies. The White House and federal agencies have tools and resources available for employers, labor unions, and non-profits to support workers who want to upskill and advance in their careers. Find Federal Funding Resources: Learn more about billions of federal dollars and programs available to support training of front-line workers. Launch an Apprenticeship Program: Check out the Department of Labor's toolkit and other resources that support starting and expanding apprenticeship programs. Across the country, employers and labor leaders are answering the President’s call and equipping workers with the skills and opportunities that they need to get ahead in their careers. The Upskill Initiative highlights the leadership of over 100 employers, who employ more than 5 million workers, and are making concrete commitments to empower front-line workers across their businesses. Or view the map fullscreen here. West Wing Week: 11/14/14 or, "The Future That We See"
This information may be shared with Federal agencies that are participating in the Upskill Initiative. Get White House email updates. Let us know how you want to help working Americans of all ages master new skills, contribute more of their potential and get ahead. now let your friends know, too.